The FreshBooks integration enables you to create invoices while chatting with customers. With it, you can keep all your sales & support communication in one place. That translates into faster service and more time to focus on difficult cases. FreshBooks is a finance and accounting software that makes running your small business easy, spending less time on accounting and more time on serving clients. The tool lets you access your documents wherever you are thanks to mobile access, customize your templates, add your logo, and send personalized “thank you” emails in a few clicks. Also, FreshBooks lets you accept credit card, PayPal and Google Checkout payments - allowing your clients to pay you online and get you paid up to 11 days. It can send reminders and follow-ups about payments to your customers. What's more, by using this solution, you are able to get paid upfront with a deposit request - no more paying expenses out of your pocket. To add to this, thanks to FreshBooks, you can track clients expenses or assign costs to invoices of particular clients. You can link its Expense Tool with your credit card and import all the expenses right from your bank. Thanks to it, you will have a full insight into your company's spendings. Integrate LiveChat with FreshBooks and gain the new possibility – creating your invoices straight during a chat conversation! From now on, whenever your customers will ask for an invoice, you won't have to switch from one app to the other. You can create an invoice straight in the LiveChat app, chatting with your customer at the same time! With LiveChat for FreshBooks, you can keep all of your sales-related communication in one place! Avoid the time-consuming email communication. Use the saved time to focus on what's important – closing more deals! Using the LiveChat & FreshBooks integration, customers are automatically notified of newly created invoices and encouraged to review them during their live chat session. With just a click of a button, you can view past invoices and create new ones without leaving the LiveChat's agent app. With live chat, you can have a direct contact with a customer that allows you to maintain and improve loyalty to your brand. 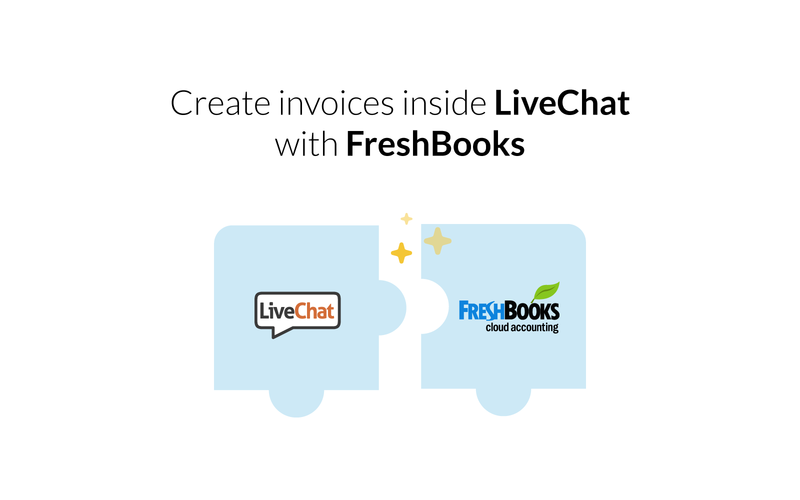 Start using LiveChat with FreshBooks now!